You will earn 816 Reward Points. Earn 1 reward point for every 1 dollar spent. The Connoisseur 825 features a high volume with low blender noise that helps ensure an undisturbed atmosphere. It has No-Tend™ technology; with just one touch of a button this technology allows you to have total control to 30 pre-programmed blend cycles without the need of being there. Each cycle shuts off automatically, freeing up operations for other tasks. It is designed to ensure speed, consistency and quality with each and every order. The 3.8 peak horsepower motor easily powers through the toughest ingredients, like ice and frozen fruits, quickly and easily. With all this power, you might think that it’s going to be noisy but the brilliant sound guard dramatically reduces noise. 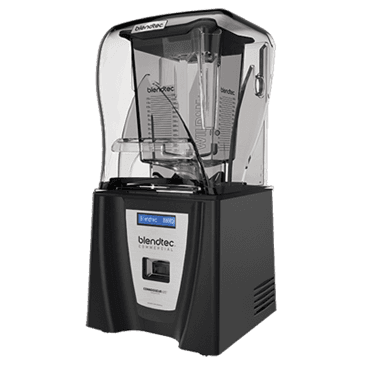 The Blendtec Connoisseur 825 produces brilliant results no matter what you’re blending, whether it's frozen fruit, frozen yoghurt, ice, vegetable greens, ice cream or grains. * Conforms to applicable UL and CSA safety standards as well as NSF sanitation standards.